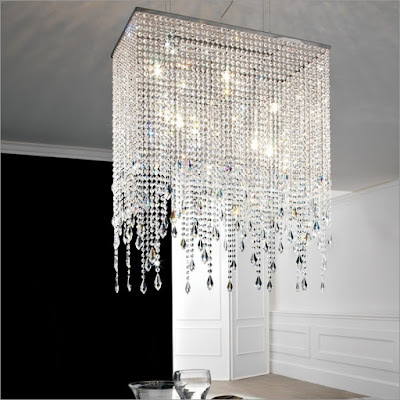 We have added a wide variety of Cattelan items to our already vast showroom display. Take my word, you will not be disappointed with the quality, style, and plethora of CUSTOM options! We just returned from our bi-annual trade show where we hand picked and curated a fabulous selection of merchandise to bring directly to you, our clients. Out of all the Italian companies out there making custom furniture, Cattelan is always on top in my eyes. In that, they consistently stay ahead of the game as far introducing new and unique materials, designs, and styles in their collection. We also had the honor and pleasure of meeting Mr. Giorgio Cattelan himself, along with his son Paolo Cattelan who make all the beautiful magic of Cattelan Italia happen. We have seen unique uses of materials like ceramic, Italian Murano blown glass and rebar used in ways, never seen before in the furniture industry. Here is a sneak peek of some goodies, that will be arriving to our showroom soon! 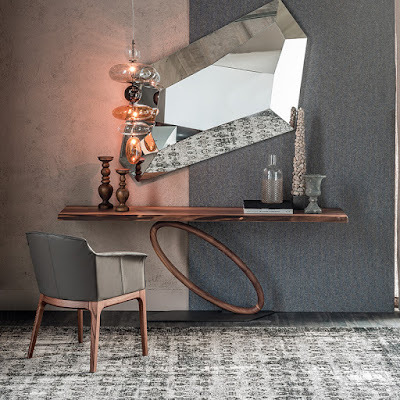 Cattelan Italia - Founded in 1979 by Giorgio and Silvia Cattelan, continues to surprise the furniture world by introducing innovative contemporary furniture for the past 35 years. Cattelan Italia is focused on producing custom-made home furnishings with a modern appeal, using state-of-the-art technology and combining values of luxury and lasting Italian craftsmanship.Today, the management of Cattelan Italia was passed on to their son Paolo, who keeps the family tradition of working with some of Italy's most famous designers. Gastone Rinaldi, Yoshino and Emilio Nanni are but a few of the design innovators who've contributed to Cattelan's award-winning collection. The Hystrix Dining Table offers the comforting symmetry of geometric lines with a smart design and style savvy modern demeanor. Made in Italy, this dining table is dramatic, and has a unique design - making it an unforgettable piece. 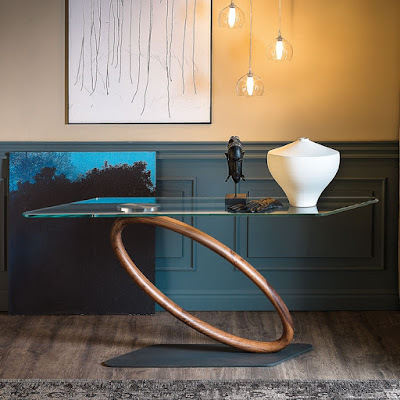 The table features a base made from reinforcing bar that is transformed from industrial building material into the elegant shape you see here. This finish allows each base to be unique and have it's own personality with the presence of more or less obvious stains, color variations, scratches and irregular edges. The Glass top is available in standard clear, extra clear or reverse-beveled extra clear glass. Paired perfectly with Magda Chair or Isabel Chair and you're all set! 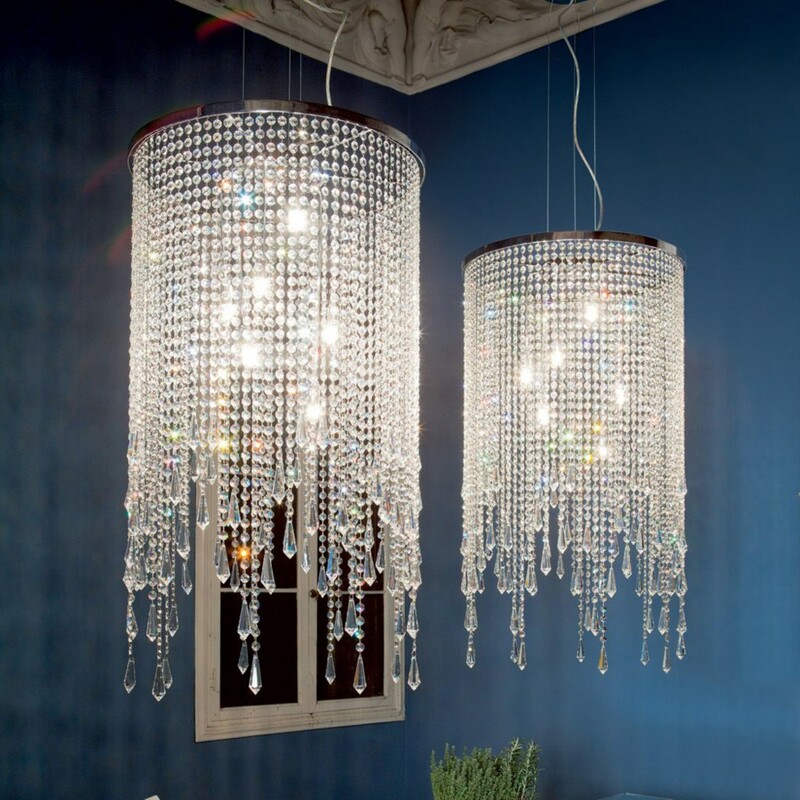 Since we unpacked this showstopper in our showroom, it has already been turning heads! 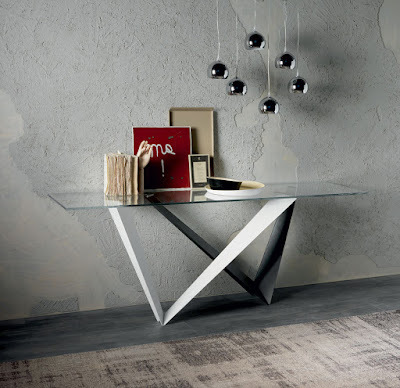 Clients are loving this table and share in our admiration of this absolutely spectacular design. Truly one of a kind! The Brandy Trolley Cart is a Modern Italian trolley bar on wheels, because why not. 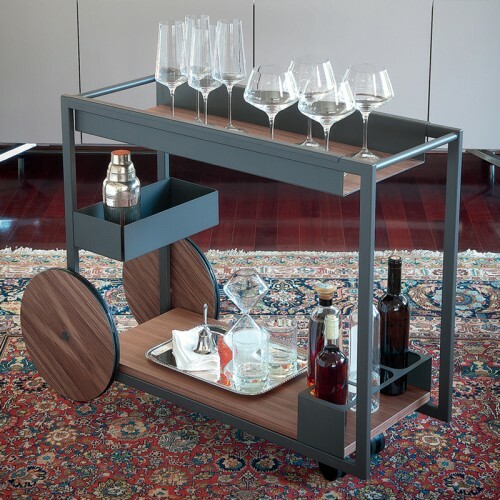 The serving cart features the base on swivel casters which make the trolley mobile and easy to move. The steel base structure is available in either white, black or graphite lacquered finish. The top surfaces and wheels of this mobile bar are in a Canaletto walnut or Burned Oak wood. The top surface is great for dishes or glassware and the hanging storage box, good for cutlery or storing any other item of your choice. The bottom platform features bottle racks for conveniently placing of your favorite drinks and storage area. Perfect for entertaining friends and family. Cheers! Link Designer TV Stand offers the convenience and functionality that's expected from such a progressive furniture piece. Link TV Stand is reversible, able to accommodate a left or right handed room layout as well as it is adjustable in width. 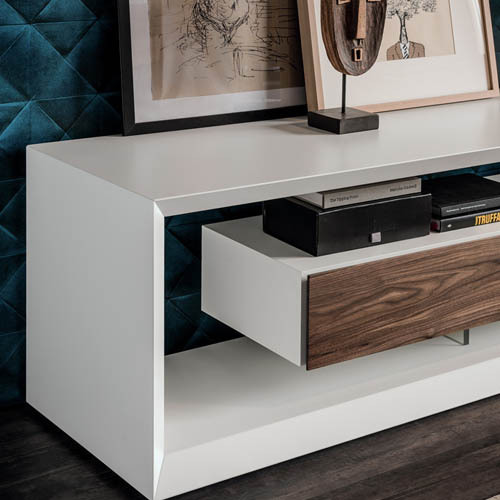 Featuring walnut door and drawers, Link TV Stand can have a white or graphite frame while its drawer is available in walnut, graphite or white lacquered wood. 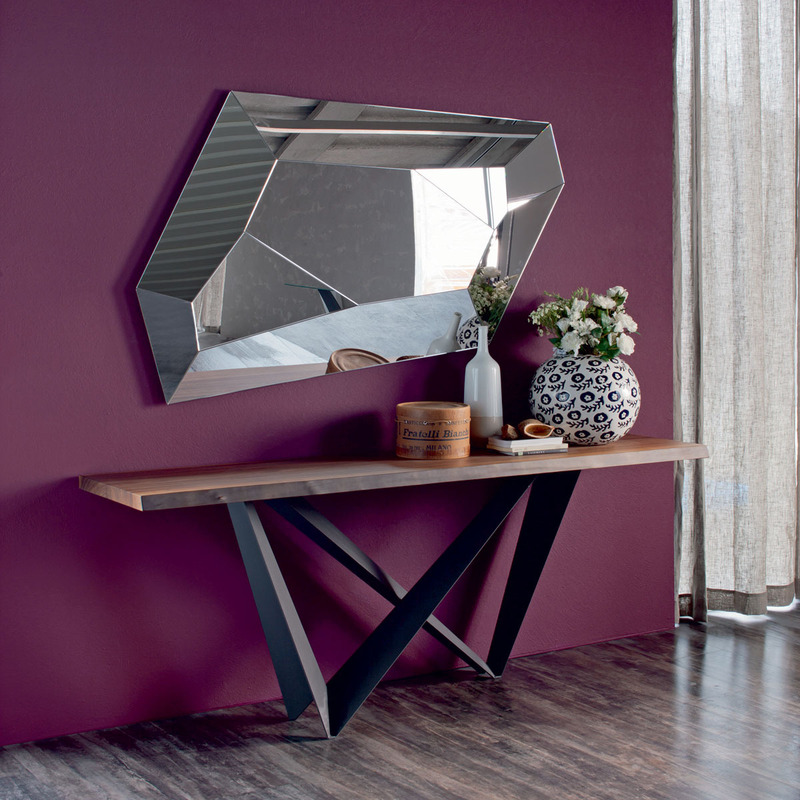 We are swooning over the Westin Console Table. Sculptural and striking, the Westin Console Table has a unique, geometric steel base that adds dramatic flair and artistry to any space. It's sculptured design will surprise you every time you look at it. The Westin Console Table will be a perfect piece for your entryway with its selections of natural finish of Canaletto Walnut, Burnt Oak or glass top, and base in White, Graphite or a combination of both. So elegant with no need for embellishment. 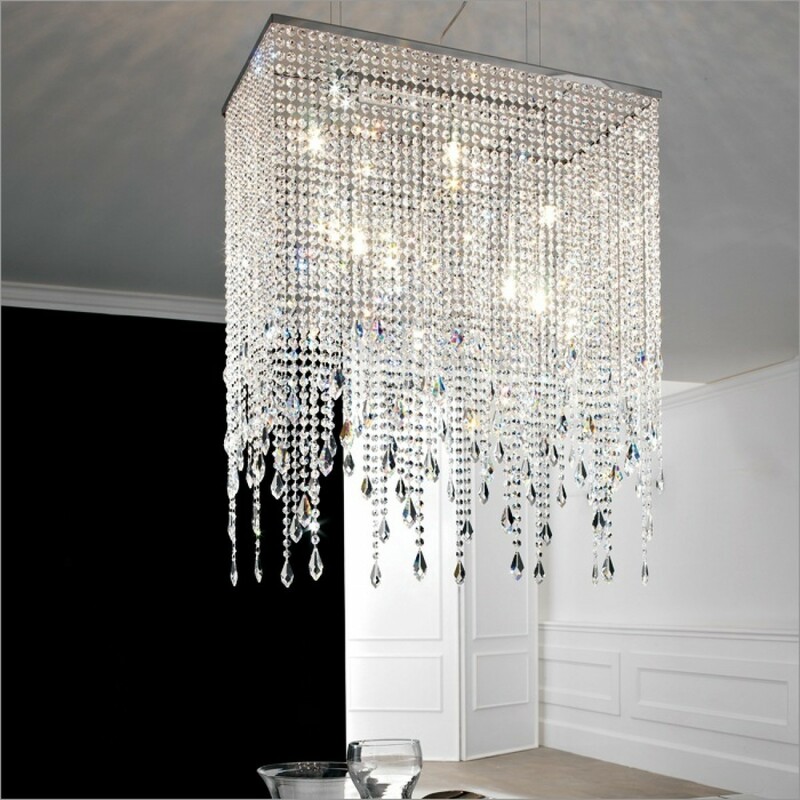 The Venezia Crystal Chandelier is an absolutely stunning piece to have in your home. 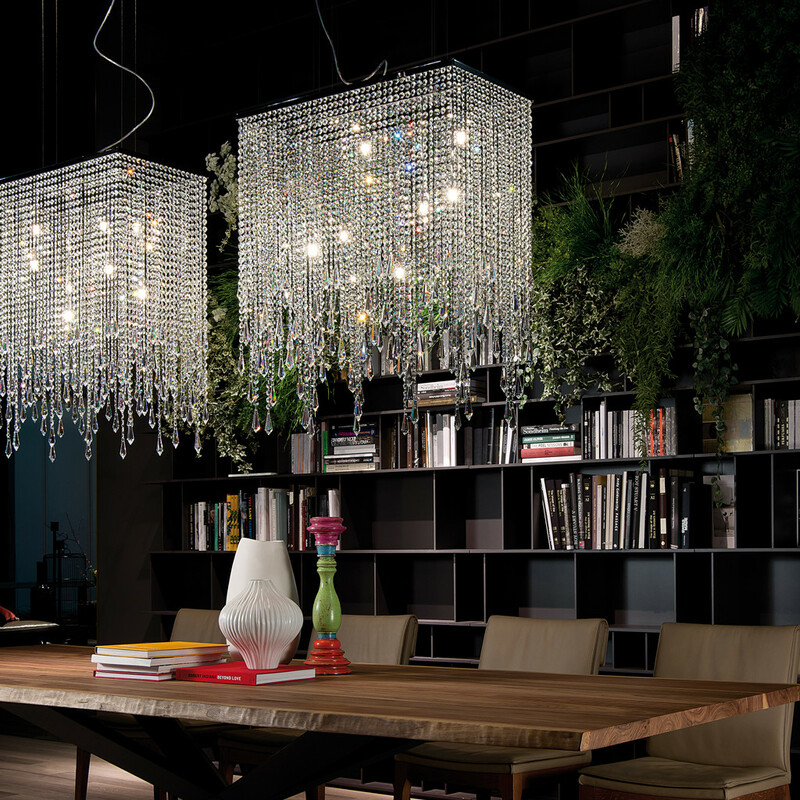 Exuberant with vibrant appeal, the Venezia Chandelier is an example of the purest form of luxurious delicateness. 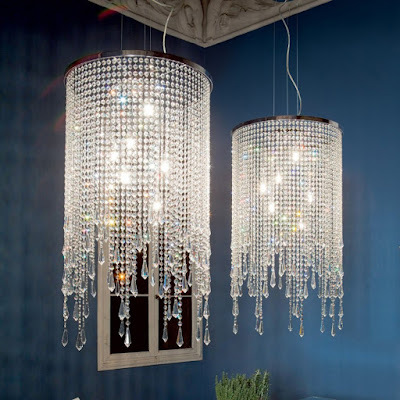 Glamour is instantly brought to the forefront of your home with this sparkling contemporary lamp design.The chandelier is a visually captivating design and beautiful decor for any dining room. The chandelier combines classic elements and reinvents them through a modern lens. Upscale bling, yes please. The sleek and modern Tour Console represents a pinnacle in glass-top console design. The eye catching table features a top made of clear glass which is supported by nothing but a circular middle section made of walnut. If that was not enough to boggle your mind, the Tour Console table features a flat base made of lacquered steel embossed in graphite. The regal quality of the Console allows for its placement to be as equally impressive in a grand entryway as in a study. You'll want to place this stunner where everyone can appreciate its beauty. The Saba Showcase is a unique piece that takes on a new and luxurious approach to displaying prized collections. With its unique quarter circle shape, its swiveling capability, full leather upholstery, and ability to light up, the case really brings to light and emphasizes the objects that are the apples of your eye. The Saba showcase is a stylish and modern system made from extra clear glass windows and shelves with an LED light to show off your treasured collections. Available in a Canaletto walnut frame or multiple leather options and a base in graphite embossed lacquered steel, find the case that best shows off your collection. All products available and on display at our Hallandale Beach showroom, visit Wasser's too see the impressive display or click here to shop the look! The high-end home, lifestyle and gift products are now available to shop our store online here or in-store at our showroom! Carrol Boyes is an iconic South African designer and her brand has deftly crafted a coveted and high-end product range of market home and lifestyle items. Her products are associated with style and finesse and are available throughout South Africa, and in over 30 other countries around the world. Her designs are incomparable and unique, succeeding in putting South Africa on the design map. To this day, the distinguished South African artist continues to combine a unique combination of humor and style in her modern and innovative designs that have become recognized around the world as timeless and distinctive. Made from the highest quality lead-free pewter, aluminum and stainless steel, Carrol Boyes’ tableware and home accessories are perfect for the home, kitchen, or office. Also known as Functional Art, Carrol Boyes’ sculptural one-of-a-kind pieces are functional for every day use and make for great gifts too. A clever mix of form and function, the iconic, homegrown range turns traditional design on its head, transforming ordinary tools into extraordinary pieces of art. Give cakes and other delicious foods the unique presentation they deserve, after all your baking efforts, no better way to showcase your own work of art on these works of art! Here are some of our top picks from the collection and must-haves if you are looking to start, or add to, your CB collection! Whether your sweets and treats are homemade or store bought the aptly named "A Piece of Cake" Cake Stand is the finishing touch to your tea time needs. 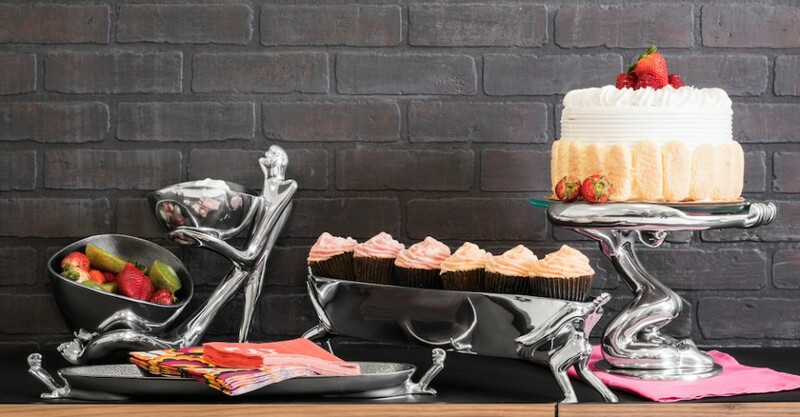 This cake stand with a curved aluminum figure detail is perfect for serving cakes, cupcakes or even to stack another food item of your choice! 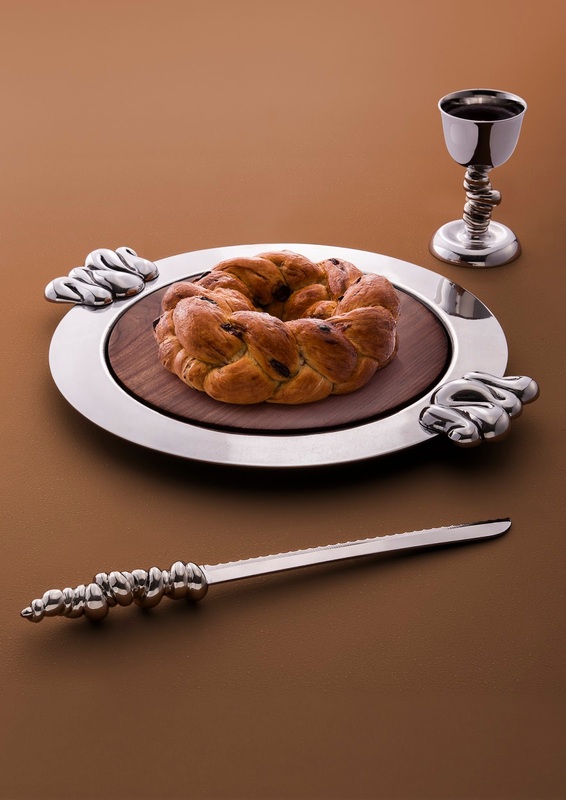 Beautifully designed Challah Board set is both stylish and functional.This exquisite and tasteful design makes for an endearing gift through their use in traditional meals and rituals and are sure to be much appreciated and become valued family heirlooms over the years. Formed of high-shining pewter and aluminum, it features a removable Indian rosewood board and sturdy handles for easy carrying. The 'Backbend' Concierge is a functional art piece for serving up fruit or adding a decorative accent to your dining room table. This sculptural centerpiece form makes a dramatic, artistic statement. Adding sculptural sophistication to dinner sets, this centerpiece will carry modern spaces to elegant heights. 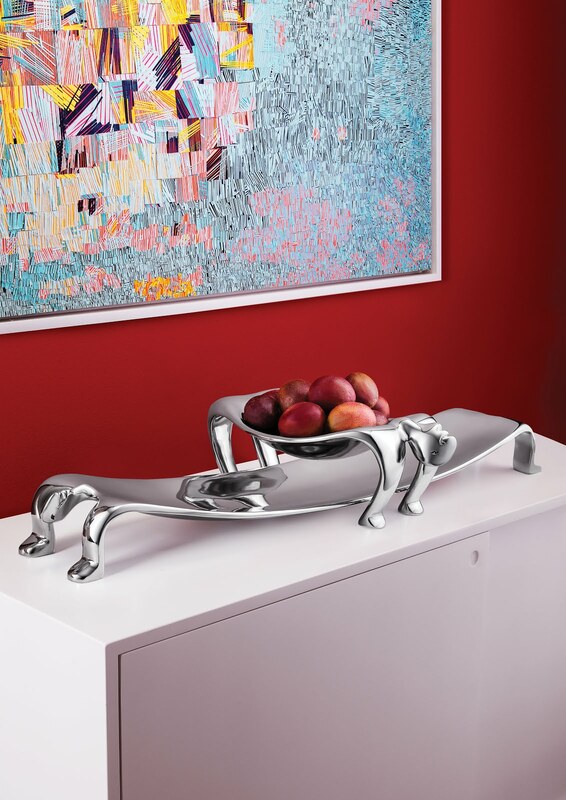 Rendered in glossy aluminium in the shape of a reclining figure, this quirky piece offers a unique and contemporary approach to your home. A showstopper! 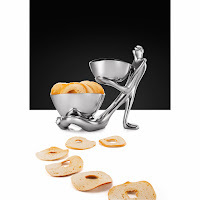 The whimsical Chip & Dip Bowl combination has more uses than you can imagine. Chip and dip, fruit and ice cream, hummus and pita-the possibilities are endless! Both aluminum bowls are powder coated allowing you to add both hot and cold foods to each bowl. Must have this on your table at your next gathering! 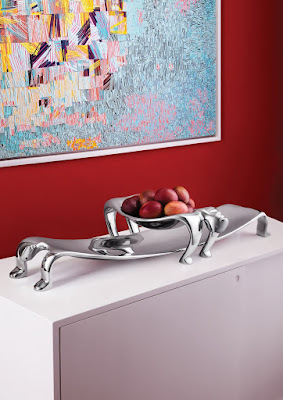 Functional art with a dash of whimsy, the Cantilever Aluminum Platter is a must have for holiday dinners. 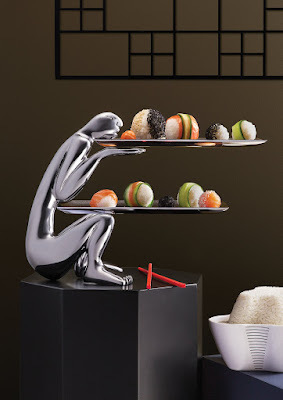 Rendered in a durable, lightweight aluminum the crouching figure is balancing two trays on its hands and knees, that artfully displays food and accessories. 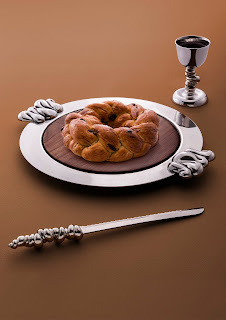 This piece adds a touch of elegance to any dinner party and dining experience. 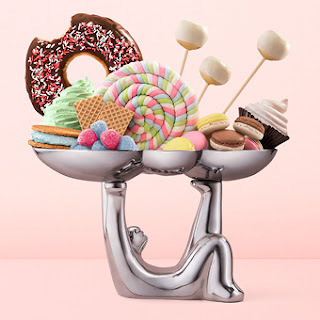 A whimsical full bodied sculptural character supports a cloud in the shape of a versatile platter. Appropriately named, On a cloud, you can serve any selection of creative snacks, to give your guests with a side of amusement. Sitting cross-legged, this sculpted character raises both arms high to hold four serving plates. 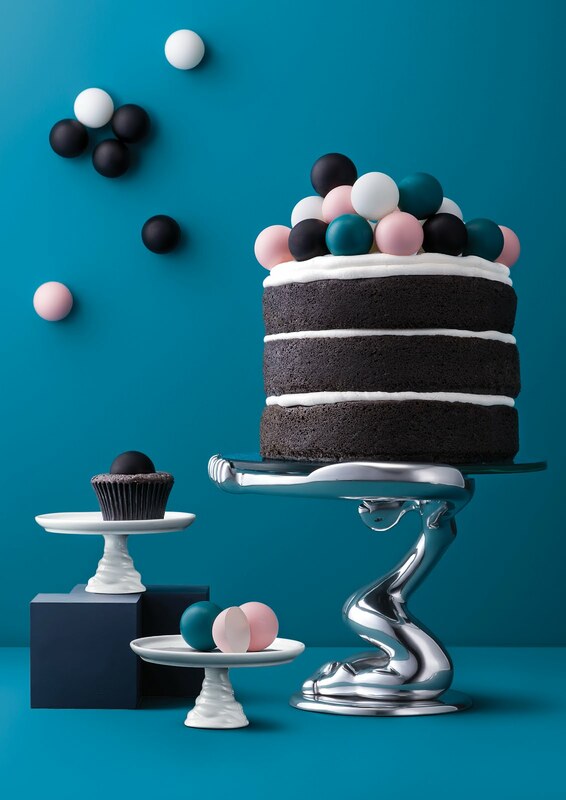 Not quite your average cupcake stand but a unique version to showcase all your exquisite pastries. 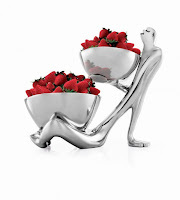 This piece is sure to grab attention at tea time while serving up some delicious bites. 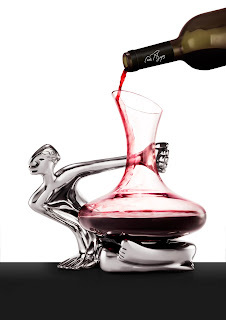 Impress your dinner time guests by busting out this absolutely charming wine decanter! Bring out the rich flavors of your favorite wines with this striking decanter set. It features a shapely glass decanter that rests artfully on a sculptural aluminum stand, lending dramatic presentation to dinners and gatherings. Cheers! All products available at Wassers, click here to shop the look! "If you wear things you adore, you just look better! "- Margherita Missoni.... Same goes for your home! 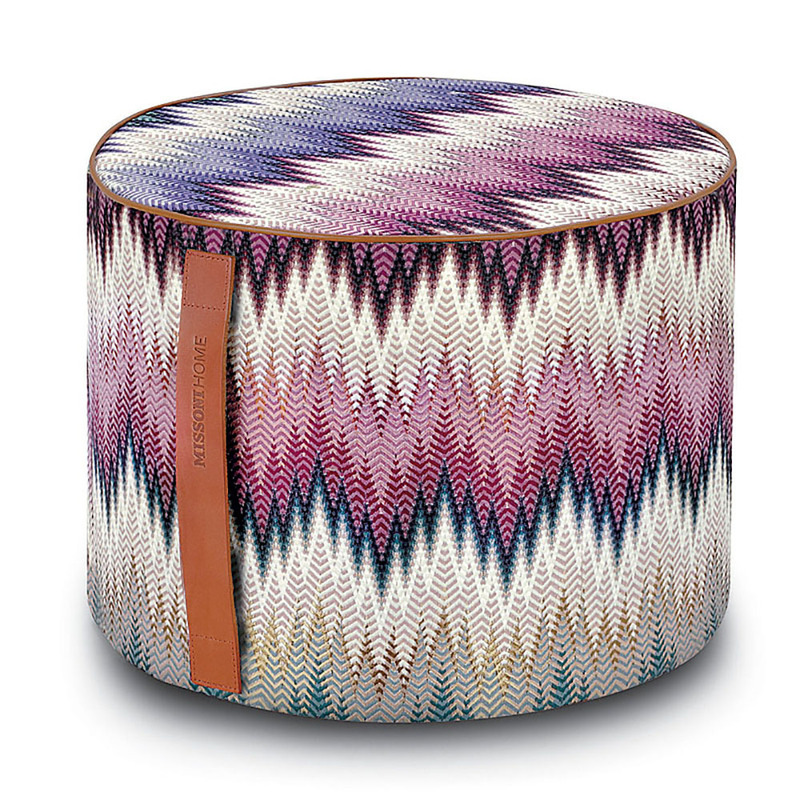 We are excited to welcome Missoni Home to Wasser's Exclusive Furniture & Interiors! 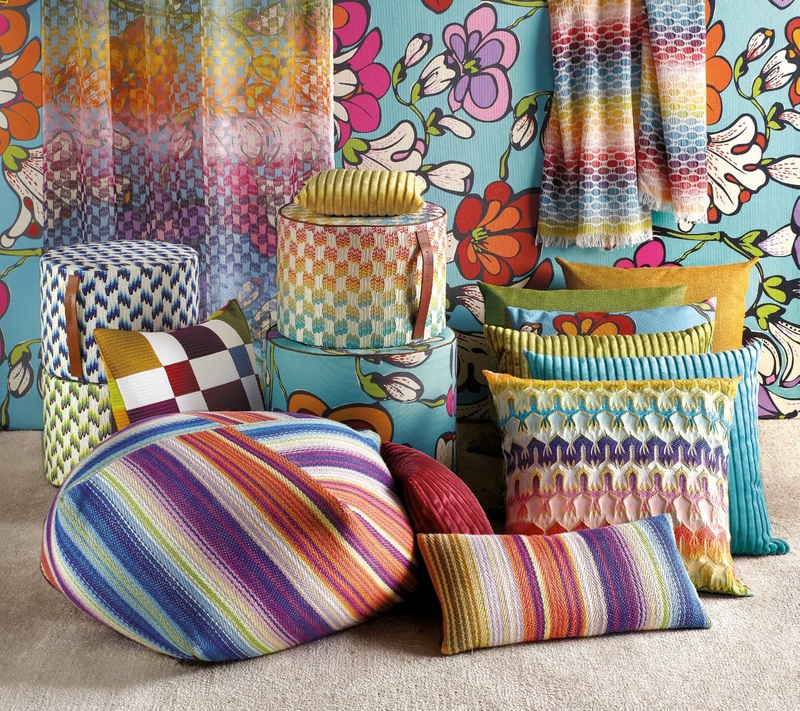 Read on to see why we are feeling the magic of Missoni Home! Need a pop of color in your home? 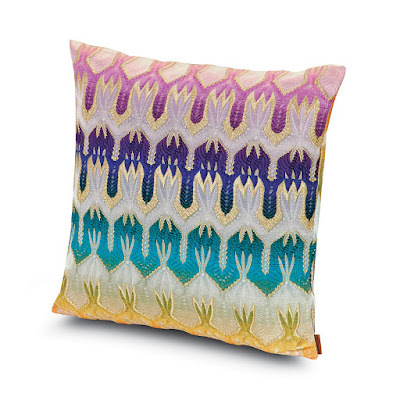 The Missoni Home Accent Pillows paired together or standing alone are a perfect mix of fun, yet chic decor. We are especially obsessing over the Missoni Home Pasadena Pillow, which is designed to make a visual impact in any space. The eye-catching design displays bright, bold tones on the woven fabric while the contrasting hues of pink, orange, green, blue, purple and yellow on the cream canvas complete the charming look of this ornamental cushion. These cushions have strong enough personality to stand alone in the corner of a sofa or topping off an accent chair, and work best stacked with others from the collection that inspire your room goals and express your personal style. 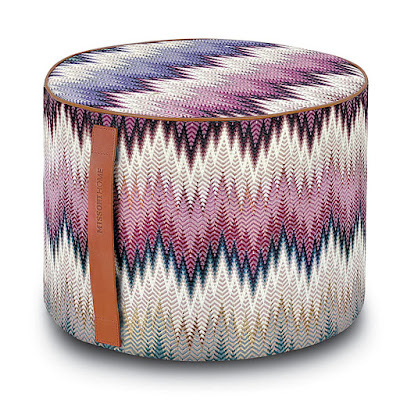 Stylish and decorative, the Missoni Home Cylinder Ottoman Pouf, is the perfect addition to your living room, bedroom or cozy nook. The stunning multi-colored hued Otttoman can be used for any area of the house and even serve as extra option for seating. This play on pattern is my personal favorite, as I am a huge fan of jewel tones, and I am just loving the Phrae collection for delivering the signature zig zag look Missoni is known for, with the perfect combo of gorgeous colors. For those of you into a more calm and neutral setting, you can still achieve the look, yet add some flair with the Missoni Home collection. Horizontal stripes of a multi-colored pattern pop out over a light, neutral shade, creating contrasts and harmonies. The vibrant colors please the eye but still keep it modern and zen. The color schemes and creativity of the elaborate styles adds beautiful décor to any room in the house, without being over-the-top for the more zen-ful outcome. 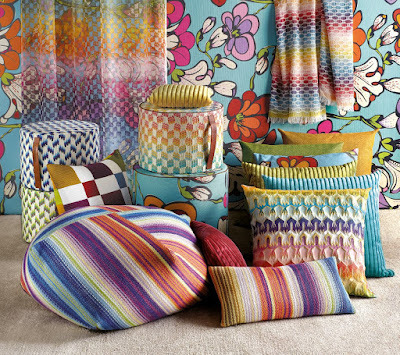 Missoni is the perfect décor for the finishing touches of furnishing your home. From fabrics, to furnishings. the collection, designed by Rosita Missoni stands out for its sunny personality and creative spirit, in which a sense of warmth is interwoven with manufacturing skill. "At Missoni Home we place the utmost importance on every aspect of the furnishing: from the sofa to the pouf, deckchairs and outdoor lounges. 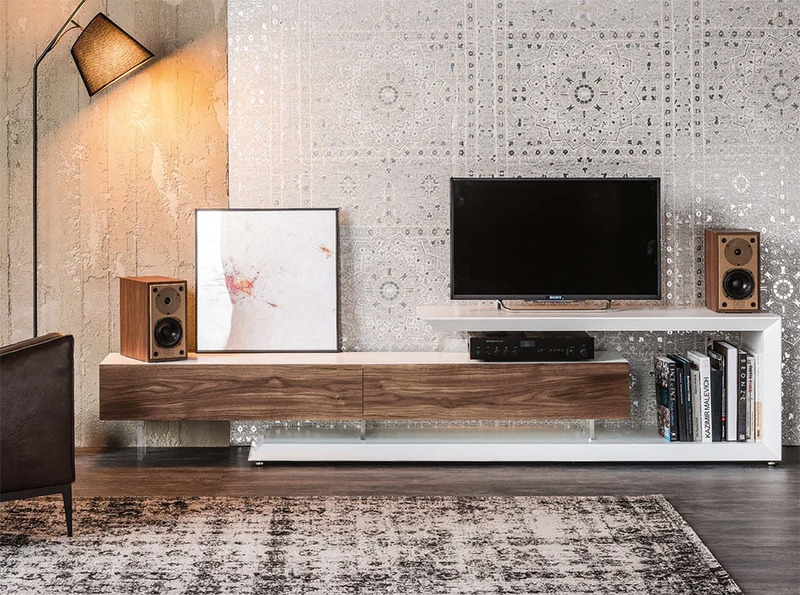 The authenticity of our furniture comes from a personal touch and the overall approach that we devote to living: no aspects excluded," Rosita Missoni. We couldn't agree more! All products below available at Wasser's exclusive, Click here to shop the look! Hallandale, FL, US January 27, 2015 – Wasser's Exclusive Furniture & Interiors of Hallandale Florida has been awarded “Best Of Houzz” for Customer Satisfaction by Houzz, the leading platform for home remodeling and design for the second consecutive year. The Third-generation family business was chosen by the more than 25 million monthly unique users that comprise the Houzz community from among more than 500,000 active home building, remodeling and design industry professionals. The Best Of Houzz designation in Customer Satisfaction was given to Wasser's because clients serviced by Wasser's were the most satisfied during 2014. ”Customer Satisfaction honors are determined by a variety of factors, including the number and quality of client reviews a professional received in 2014. Wasser's received a “Best Of Houzz 2015” badge on their profile, helping Houzz users around the world who discover and love a professional’s work to learn even more about that business’ popularity and satisfaction rating among their peers in the Houzz community. "We are so thrilled that so many Houzz users have been inspired by our projects and so satisfied with our work," said Jaime Wasser, VP at Wasser's Exclusive Furniture & Interiors. "At Wasser's we strive to provide exceptional customer service on a personal level to all of our clients each and every day. We know consumers have a choice when selecting the store they wish to purchase their furniture & accessories for their homes and appreciate that they continue to choose us, refer us and share their positive experiences on Houzz." "Tracing our history back three generations in our Hallandale location, wasser’s is your destination for Designer-Brand Furniture, Quality Craftsmanship, Incomparable Customer Service and Guaranteed Best Prices." “We’re delighted to recognize Wasser's Exclusive Furniture & interiors among our “Best Of” professionals as judged by our community of homeowners and design enthusiasts who are actively remodeling and decorating their homes.” said Liza Hausman, vice president of industry marketing for Houzz. Wasser's showcases client and designer projects through its social media channels using the #wassersfurniture hashtag. 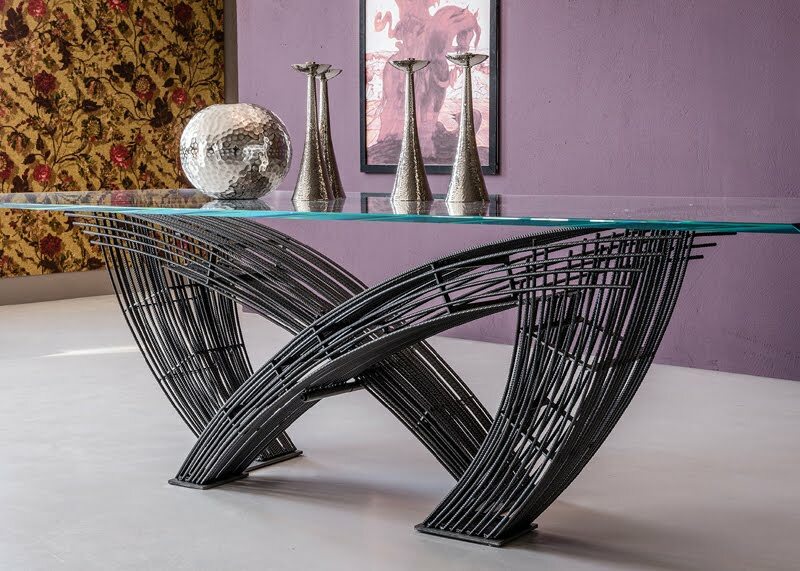 Wasser's is south Florida's Luxury Furniture Haute Spot. With our block long showroom & over 100,000 square feet of warehousing, we can provide all of your Interior Design needs, including Designer Furniture, Bedding, Custom Closets, Lighting, Marble Flooring, area rugs, accessories and more. 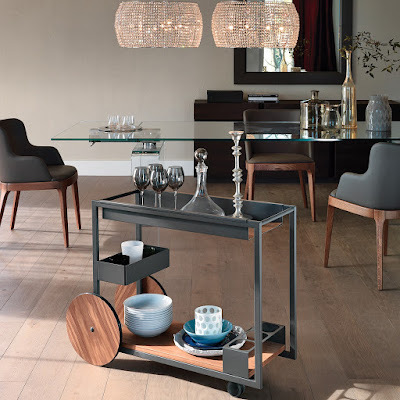 We specialize in contemporary furniture from the worlds leading furniture manufacturer's and have a large selection of fine furniture crafted in USA and Italy. We are south Florida's Platinum dealer for American Leather®, where you will be pleased to see how many styles we represent in both the regular line and the more exclusive Comfort Sleeper Gallery, Comfort Recliner Gallery, Anniversary Collection, Home Theatre Collection and more with a full Leather wall and fabric available, all made to order in the USA in just 30 days. With Wasser’s, you can rest assured that you are in the hands of "Personal Service Specialists"® as well as furniture experts with a long record of customer satisfaction. Bring us your working drawings or floor plans as we offer professional consultations to complete your designs through the services of Licensed Architects, Engineers and Contractors. We’re proud to bring you the Comfort TheatreTM by American Leather® featuring infinite-positions that adjust to your exact comfort needs. The Infinity SystemTM offers unlimited ergonomic adjustability to support you where your body needs it most. What makes a great at home experience when streaming your favorite movie or binge watching a TV show on Netflix? American Leather Comfort Theatre™ is the answer to all of this. Weather you are creating that perfect man cave for Dad or a movie room for the whole family to enjoy, the Comfort Theatre features infinite-postions that adjust to your exact comfort needs. Why is the Comfort Theatre™ the best? We provide a lifetime warranty on the frame and suspension of this piece of furniture. We also warrant this piece of furniture to be free of defects in the workmanship and materials, other than frame and suspension, for five years from the date of purchase. The Comfort Theatre™ mechanism is under warranty for ten years from date of purchase. The Comfort Theatre™ is perfect for having the guys over for Monday Night Football, the girls over for an episode of Scandal or Family Movie Night. No matter what you are doing this is the ultimate way to maximize at home comfort. Available in endless configurations and leather or fabric options! 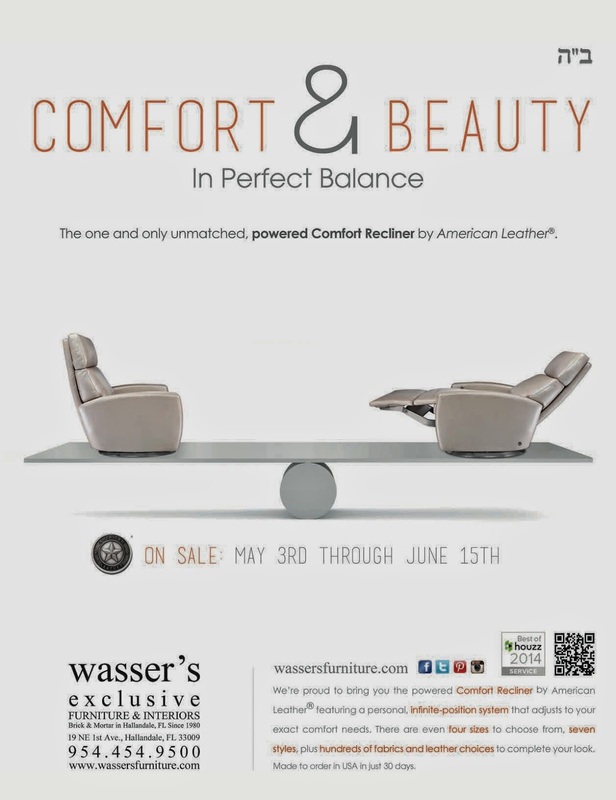 Come visit Wasser's Furniture to experience the true comfort and see how we can help you build the perfect configuration for your space.